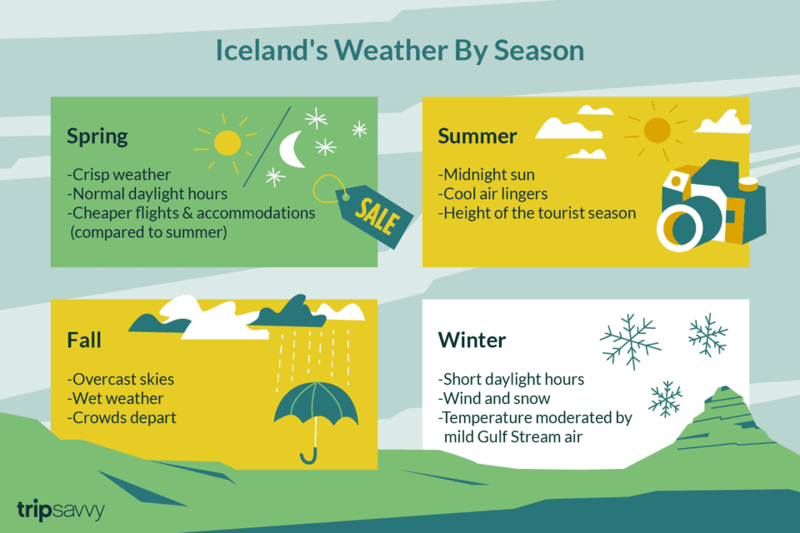 If you're planning to visit Iceland, the most popular travel times are during the summer months of May through August when you can enjoy lots of daylight hours. December is also popular for the winter holidays, although it will be quite dark during that time—check current local weather conditions in Iceland before you go! Iceland, near the Arctic Circle, actually has a cold, temperate climate due to the North Atlantic Current that carries Gulf Stream warm water north, ensuring generally higher temperatures for Iceland than in most places of similar latitude in the world. Iceland's climate includes conditions typical for Scandinavia, but there are are some variations between different parts of the island: The south coast tends to be warmer, wetter, and windier than the north, and snowfall in winter is more common in the north than in the south. Known as the Land of Ice and Fire due to its many volcanoes, Iceland is always subject to the possibility of volcanic activity. Iceland's highest air temperature recorded was 86.9 degrees Fahrenheit (30.5 degrees Celsius) in 1939 on the southeastern coast, and the lowest temperature was minus 36.4 degrees Fahrenheit (minus 38 C) in 1918 at Grímsstaðir in the northeast of Iceland. Temperature records for Reykjavik were 76.6 degrees Fahrenheit (24.8 degrees Celsius) in 2004 and minus 12.1 degrees Fahrenheit (minus -24.5 degrees Celsius) in 1918. Spring might be the best time of year to visit Iceland—aside from the busy tourist season of summer—because of its crisp weather, normal daylight hours (compared to North America), and significantly cheaper pricing for accommodations, flights, and travel. Spring first arrives in April, bringing with it warmer temperatures and the first signs of green grass and flowers. Travelers can fish, go whale and bird watching, golf, horseback ride through the thawing landscape, or even visit an off-season ski lodge to watch the snow melt off the mountains. What to Pack: Temperature averages range from 39 degrees Fahrenheit (4 degrees Celsius) in early April to 50 F (10 C) in June, so you'll still need to pack warmer clothing, especially for the slightly colder evenings. Summer is the height of tourist season in Iceland, and in midsummer—during the entire months of June and July—daylight takes over during a time known as the Midnight Sun, when there is no nighttime darkness. There are plenty of outdoor activities like horseback riding, hiking, and even swimming, but many theatres, operas, and symphony performances are suspended during this busy time of the year when Icelanders take their summer vacations. What to Pack: It never really gets hot in Iceland due to the gulf stream bringing cooler air into the country throughout the nightless summer, so bring a light jacket even in the warmest season. As September comes around, bringing back the night, the tourist season abruptly ends, and many museums outside of Reykjavik close down until the following summer. However, there's still plenty to do in the fall. Keep in mind that because the Gulf Stream brings milder air from the Atlantic Ocean in contact with colder Arctic air, the skies are frequently overcast with driving wind and rain and abrupt weather shifts— you might just experience four seasons in one day! October through December is also the rainy season in Iceland, making outdoor adventures harder to find. Still, with the cultural events like plays, musicals, and orchestra performances resuming in the off-season, there's plenty to keep you entertained throughout the fall. What to Pack: You'll need to pack a variety of clothes for fall, given the diversity of weather. No matter what, it is the wettest season in Iceland, so proper waterproof clothing, especially a coat and boots, are musts. Prices for airfare are drastically lower in the winter season due to a decrease in tourists traveling to the country but keep in mind that Christmas and holiday travel will still be slightly more expensive than other non-peak travel days. In midwinter, there is also a period of no sunlight, and darkness prevails during a phenomenon known as the Polar Nights, which is a perfect time to view the Aurora Borealis (Northern Lights). Thanks again to the Gulf Stream air, winters are typically milder than elsewhere in the world—in fact, New York's winter is much colder even though it's technically further south on the globe. What to Pack: Pack warm layers, including sweaters, multiple base layers, and a heavy coat or jacket. Sturdy, warm footwear is a must as well. Iceland isn't nearly as cold as many people think it is, and the near all-day light of the Midnight Sun makes for a spectacular adventure.